I prefer to go by Kattie (pronounced Kay-tee) or Kaitlin Michelle. No! This is my first time! 1. Do you have a favorite book? YES! Several! I love the Harry Potter series, and Night Circus by Erin Morgenstern, and anything by Chuck Palahnuik! YA! Especially realistic, gritty fiction or dystopian. I have no idea why I am so drawn to it. 3. If you could recommend one other book blogger, who would it be and why? Paper Fury! I love everything she posts! She is witty, and amazing! Plus there are dragons, and cake! 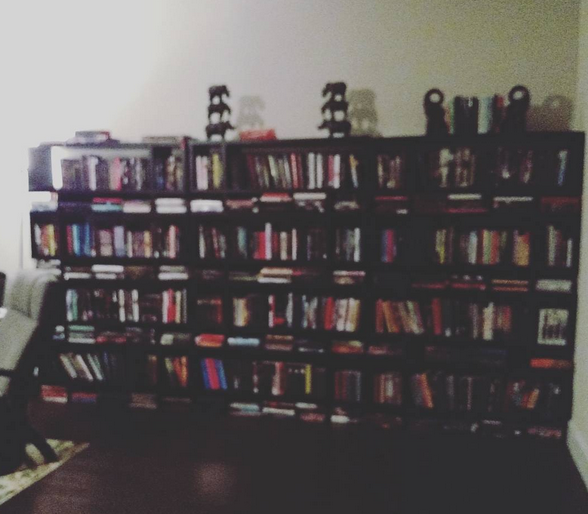 I arrange my books alphabetically by author. I wish I could do it by color, but then I would never be able to find anything, and I would have to split up the series and that freaks me out! 5. What book are you most excited for on your TBR? All of them! My TBR is OUT OF CONTROL! I keep buying and buying books, and I WANT TO READ EVERY SINGLE BOOK RIGHT THIS MINUTE! But…..that is just not possible so my TBR keeps growing and growing. 6. If you could choose three characters to have lunch with, who would they be and why? ONLY 3?!?!? Alice from Wonderland, Hermione from Harry Potter, and oh gosh, this is hard, Hatter M from the Looking Glass Wars series. PS: Are you at actual BEA this year (**seethes with jealousy! **) or participating in Armchair BEA? Tell me everything! Ooo series on a different shelf!!! Such a good idea!!!!!! I wanna do color!!!! YAY Welcome to your first ABEA! 😀 I love Chuck Palahniuk as well. I read The Night Circus last year and couldn’t get into it, just had too much going on lol. Ahhhh! The night circus seemed so amazing to me, but I’ve had a couple people tell me they didn’t love it. I need to re-read it! I completely agree…I’d want to have lunch (or coffee or tea…okay maybe not tea given Wonderland…) with Hatter M!! Yaasss! So many people don’t know who that is! Its been a long time since I’ve picked up the books, but his (I think it was his first) graphic novel gave me enough pause to consider reading Alice in Wonderland again…but then I just read more about him instead XD less nightmares!